According to a report on Variety, G4 - one of the only TV stations in the world with a "geek" mandate - will be "rebranded" early next year, resulting in a change of focus and possibly a change of name as well. In other words, it'll be an almost entirely new/different channel. NBCU, the station's owners, are reportedly looking at turning it into a TV version of GQ, ditching the nerd focus in favour of something more "modern male". 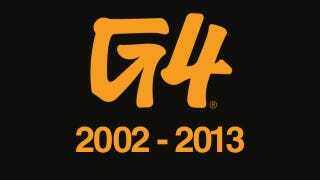 Beginning in 2002 as a purely video game-oriented channel, G4 slowly evolved into a more general "young male tech/geek/game" site, with its most popular shows at the moment being Attack of the Show! - which in recent years lost both its popular hosts, Kevin Pereira and Olivia Munn - and American Ninja Warrior. There's no details on just what a "modern male" rebranding would entail, but I'd bet you could expect a lot more coverage of micro-breweries, indie bands, expensive loafers and designer laptop bags. Clarification: Variety's report does also indicate that "The guy-centric net is mulling a more sophisticated look while remaining true to its tech and vid game roots." So video games may still have a home there, though in what seems like a very different, less geek-targeted context.